How many mission statements have you read that sound like this? Whoa, wait. Did you fall asleep? I’m pretty positive I did. And this is the biggest problem with mission statements; they manage to say nothing and sound like everyone else while doing it. Branding is show, don’t tell. A mission statement should showcase the guiding principles of your company and help customers understand your brand promise. The trouble is these statements are often pounded into inoffensive dust and banal platitudes by the fear of offending someone. It’s hard to be held to your promises when you didn’t commit to any. Ditch the mission statement. Write a manifesto. Manifestos are a combination of value statements and promises. They connect your brand promise to your customer’s values. They strongly rule people in or out and they drive those who are in to action. Manifestos connect your brand promise to your customer’s values. A manifesto is a collection of your brand’s beliefs and values combined with a description of how you live those within your business. This serves a dual purpose; it clearly and uniquely explains how your brand views and moves within the world and it allows potential customers to see themselves as part of it. It gives your customers a place to plug in and say yes, I agree with this, I believe it too. People who believe what you believe are more likely to want to work with you, recommend you, and be loyal to you, even in the face of competitive products. Manifestos strongly rule people in or out. When you set out your beliefs and values, you are allowing people to judge if your ideas fit their view of the world. This takes guts. You need to be willing to let some people go in order to create space for the ones who really want to stay. This is a good thing. You are writing a brand manifesto, not a brand suggestion. You aren’t musing about how you might try and keep this promise. You are saying definitively that this is what you believe and that you are determined to achieve it. Manifestos inspire people to action. While mission statements are languishing quietly on the wall, collecting dust in their cheap office store frame, manifestos are rallying the troops. Mission statements are conducting a quiet game of business buzzword bingo while manifestos are out in the street with a bullhorn, calling people to join you. Manifestos are laying out the rules of engagement and inspiring people to participate. Give your customers something to talk about, believe in, and act upon. Give them a manifesto. Manifestos are one of the best weapons in the war against brand invisibility. When you clearly articulate what you stand for, why you believe it, and how you live that in your business, you set yourself apart. 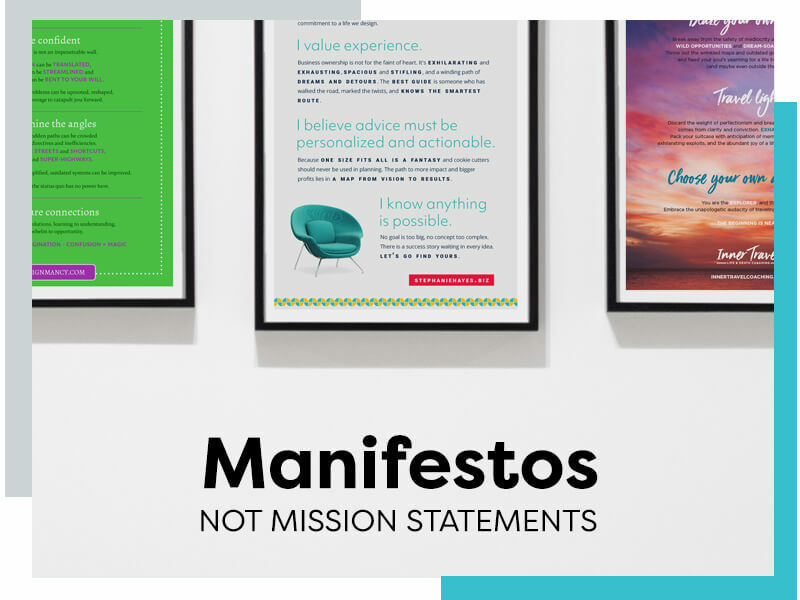 Manifestos are the baseline for positioning statements, offer creation, story telling and customer interaction. They are the living embodiment of your brand promise and a clear call to those who want to participate. If you want to build a tribe of loyal evangelists, this is where you start. If you’re interested in creating your own manifesto, I can help. Learn more here or get some inspiration from ones already out in the wild.